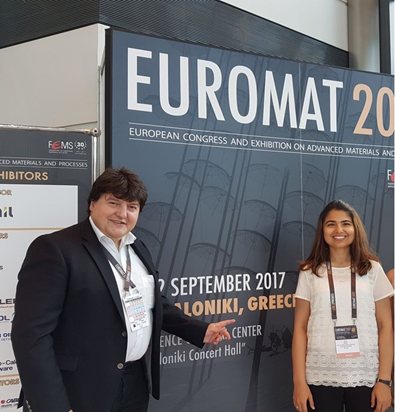 HyMedPoly project supervisor Prof. Aldo Boccaccini and PhD researcher Seray Kaya from the University of Erlangen-Nuremberg, Institute of Biomaterials attended the European Congress and Exhibition on Advanced Materials and Processes, EUROMAT 2017, held in Thessaloniki, Greece, on 17-22 September 2017. Prof. Boccaccini co-organised two symposia in Topic Area F “Biomaterials and Healthcare”, namely symposium F1 “Biomaterials for Tissue Engineering” and F4 “The Next Generation of Implants with Multi-Functional Properties”. 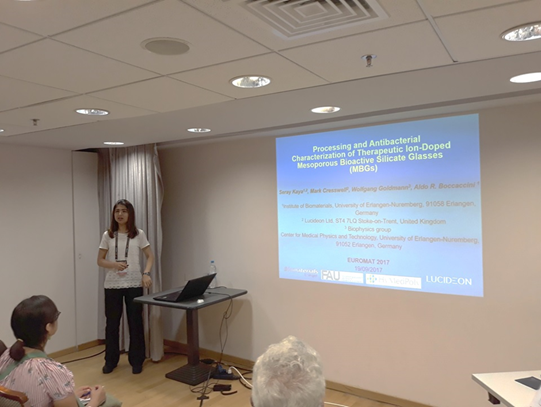 An oral presentation was given by Seray Kaya on “PROCESSING AND ANTIBACTERIAL CHARACTERIZATION OF THERAPEUTIC ION-DOPED MESOPOROUS BIOACTIVE SILICATE GLASSES (MBGS)”. Seray is currently seconded to Lucideon Limited in Stoke-on-Trent. Her presentation was co-authored by Dr. Mark Cresswell from Lucideon Ltd., by Prof. Wolfgang Goldmann from the University of Erlangen-Nuremberg and by Prof. Aldo Boccaccini. The conference was a good chance for the young and experienced researchers to come together and follow the recent studies done all over the world.